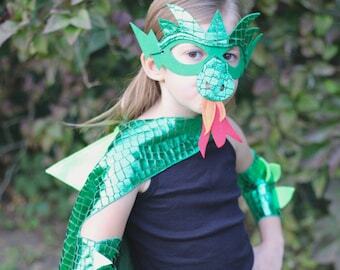 Dragon lovers, we have the perfect spiky, scaly, fire breathing, adventure making costume for you! 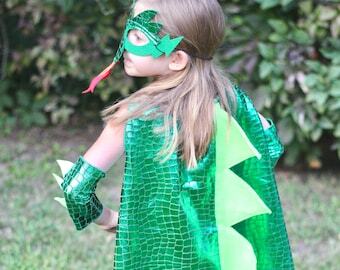 Whether you are looking for the perfect kids dragon costume for Halloween or that special birthday gift to expand your dragon lovers creativity, Superkid Capes has lots of options to help you out. 1 dragon cape, with the option to add accessories. 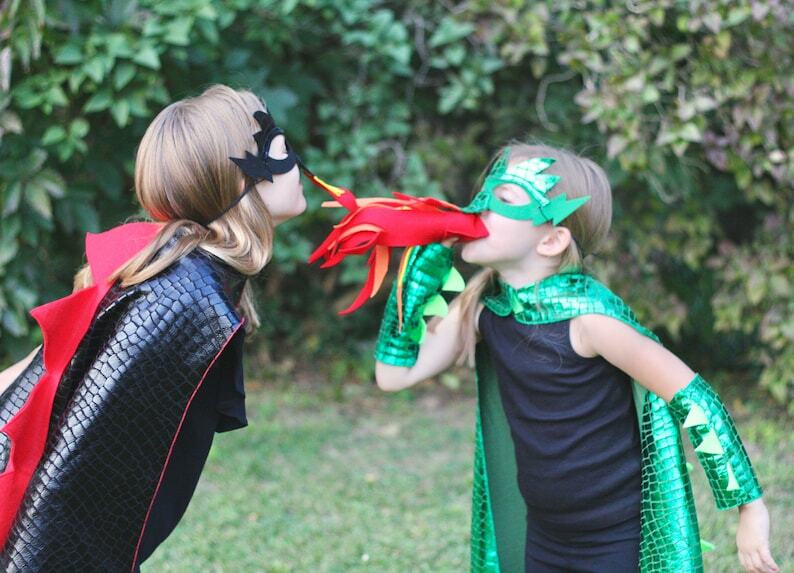 Our signature dragon cape is made of a shiny scale material in either black or green. This cape has an awesome affect in the light. It has a scalloped bottom edge, complete with dragon spikes and tail. The optional dragon mask is adjustable, the arm bands are one size and slide onto the arms. 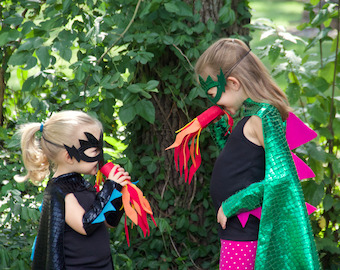 The fire breathing accessory is made of felt. Capes are approximately 23 inches from the back of the next to the base of the cape, which is the safest length for ages 2-8 years old. The capes close at the neck with elastic that is sewn in place, and easy to release by the child. Shipping: Your order will ship 5-7 days after purchase, sometimes faster! We have flat rate and priority mail options. Very well-made, high-quality costume... my 3 year old just about died when he saw it. Will be buying again for sure. Not impressed. I finally received it over 2 weeks after the latest ship date noted on the shop. Missed my son's party & birthday and that's with not even getting to pick the colors or specialize like others. There was a communication we sent to the buyer that we were waiting for an answer on, that she did not receive. Once we realized she did not received it, and her deadline was not going to be able to be met, we apologized and offered to cancel the order. She declined our offer, and said, "Yes please still ship it. He can get it late. Thank you" We shipped out the item and included complimentary accessories for the miscommunication. Regarding the color of this cape, a customer can always ask for a color change, which she did not. 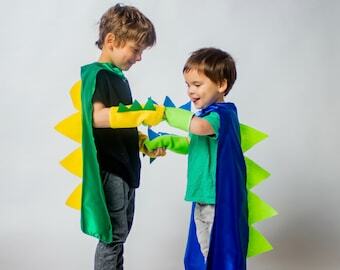 We have a similar version of this Dino cape without the hood that offers 9 different color combinations. Unfortunately the buyer did not choose any of those capes. We try to have open communication with customers even if a deadline cannot be met which we tried to do here. How long will it take for my item to ship? We ship most everything in 3-5 days from time of purchase! Some items may take longer to receive. Just check your item listing for the shipping timeline specifics. We ship USPS flat rate mail both within the US and outside the US. This includes delivery confirmation within the US. If you would prefer a different carrier used or have a Fedex or UPS account number you would like used, we can usually accommodate. Just ask! What guarantees do you offer regarding a delivery date? We can guarantee a departure date, and usually a delivery date if we are given enough time to fill your order. If you need something super fast, we can ship your items via express mail which will offer a guaranteed delivery date. I don't see the colors I am looking for, can you make something customized? Yes, we love custom orders! Just send us a message with the colors you are looking for and we will let you know what we can do. Please be aware, sometimes customizing beyond our regular offered colors will add a few days to the construction time. How do you handle lost or stolen packages? Most of our orders include delivery confirmation information. We will not be held responsible for orders where the details show the package was delivered. In this case, you will need to contact whichever carrier was used to inquire about the delivery, or file a claim. Is everything sewn down on your capes? We take great pride in the craftsmanship of our capes. The capes are made from scratch in our workshop in Indiana. All the felt elements on the cape are sewn down. If a cape is personalized, either special heat transfer vinyl is used, or special heat transfer material that has been printed, and pressed with a professional grade heat press into the fabric. What are the washing instructions for capes? Yes! Our capes can be washed. While the satin we use is machine washable, as well as the felt, felt always stays nicest with minimal washing. We recommend spot cleaning first. But you can throw your cape in the washer on a delicate cycle. Then shake out, and hang or lay flat to dry.